With it being the new year, many are attempting new ways to better their lives. Though I’m not one for traditional resolutions, I believe one trick to seeing your goals through to the end of the year is by starting small and slowly building it up. What is the number one reason people fail at their resolutions? I believe it is because they attempt to change their lifestyle so drastically that they either wear themselves out or they set their goals too high. In the art of managing money, it’s no different. That is why I want to show you a method where you can save $2,756 this year and it’s an idea I’ve actually incorporated into MY budget for the year as well. If you were to stick to this idea, then by the end of the year you will have saved $2,756. 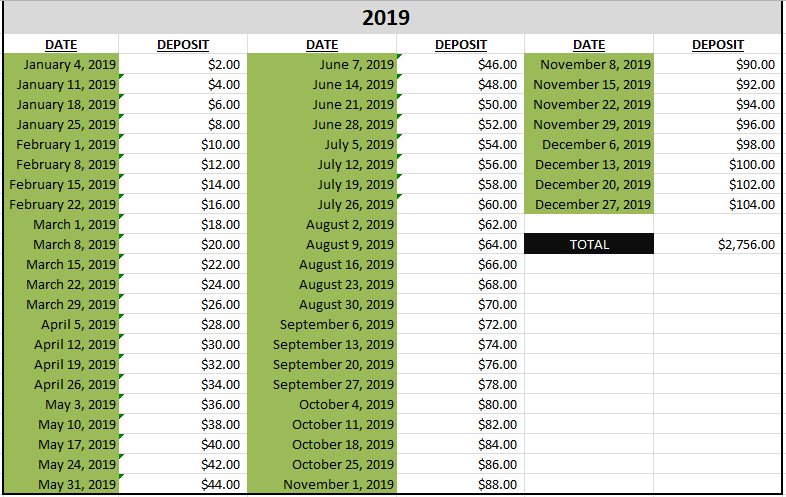 Now, I know what some of you may be thinking… That $104 by the end of the year is a big chunk of change to deposit into a savings account in one week. It’s true, $104 may be hard for people to do depending on their income and expenses, but with slowly building up to that amount throughout the year, the sticker shock wont seem so bad. Also, with the help of this chart, you can plan AHEAD for your weekly savings deposit. Planning ahead will actually encourage you to make smarter decisions with your money. Do you go out to the bar this weekend or do you stay home, maybe invite some friends over and save the money for next weeks deposit? The thing many people have forgotten is that new year resolutions are meant to improve yourself for the long term. By getting into a habit of watching your money NOW, you are essentially teaching yourself the importance of saving your money for years to come! Yes, saving over $2000 this year is a great goal, but why stop there? If you were able to stick to this idea for the duration of 2019, then imagine what goals you could set for yourself next year! All I am saying is: it doesn’t hurt to try… and who knows, you might surprise yourself. I hope this gave you a new idea on how to save money. If this article taught you something valuable or inspired you, make sure to bookmark my site and find me on social media through the links below to keep up with all of the upcoming articles I’ll be posting about pinching those extra pennies. Also, feel free to join my new social club on Facebook if you would like to connect with others who are also looking to better their financial situations. Thank you for your support, and I’ll see you next time! Previous PostCan Certain Online Affiliate Programs Hurt Your Reputation? Next PostWhat’s better for YOU, an Active or Passive Income?